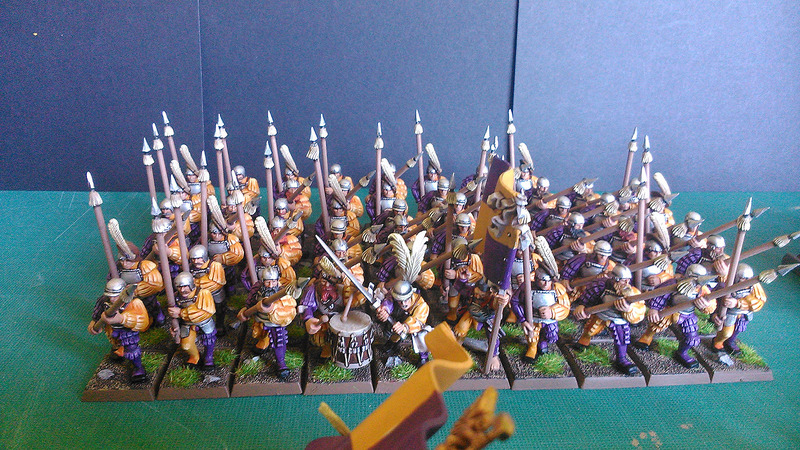 Not only it's difficult to accomplish, but also I don't want 12K points army with an eclectic colour escheme. Hey, sacrifices have to be made! I guess you can get away with picking a good handful or so of colors schemes you like and then claim that the cowardly [insert less favorite provinces here] were guarding the baggage train or the extreme flanks. But, three different colors seems a bit low, this is the Empire coming together after all. All right, all right Naitsi... you win. This is 10 armies of 15 possibles. Not bad, isn't it? hey, you forgot Middenland! alright, alright, I'll shut up. Looking forward to a riot of Imperial colors. More victims for Asavar... ups, sorry! I mean, more troops for the Empire army! 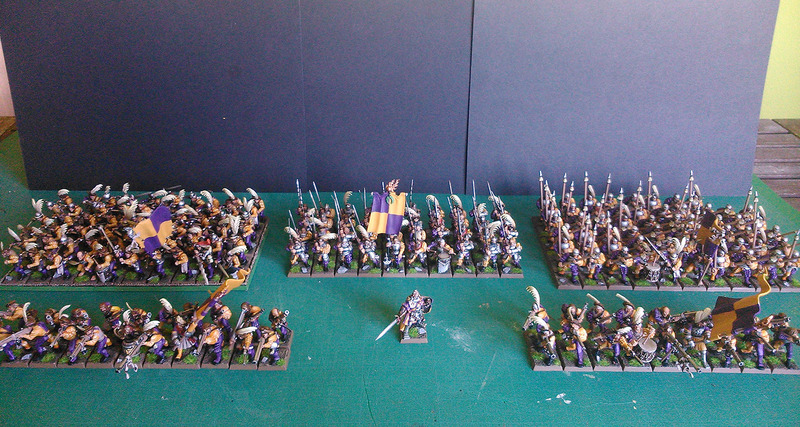 This time, 40 swordmasters. 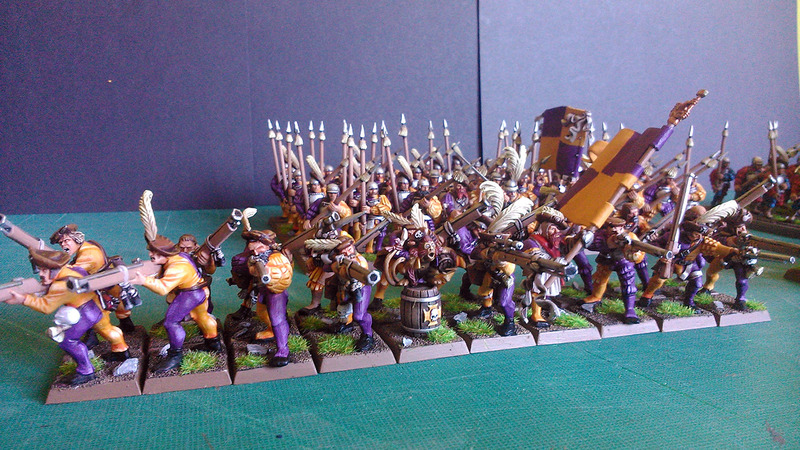 I think this is the fastest large unit I ever painted (and basing! ): 9 days. Obviously, I cannot keep this pace for long, but meanwhile, the lines of the empire grow quickly. As it's said before, I will paint the emblem of the standards all together, this is whay the banner is empty. The war altar and Ostermark soldiers are awesome! Impressive altar, and I love seeing the photos from before ("the pile") and after painting the infantry. Great work transforming old figures with fresh paint! I'm one of the Empire generals on this titanic battle, I've played Empire for long and now I'm planning to paint the maing part of my collection as long as a big part of my dogs of war. And let me introduce you the Stirland halberdiers. 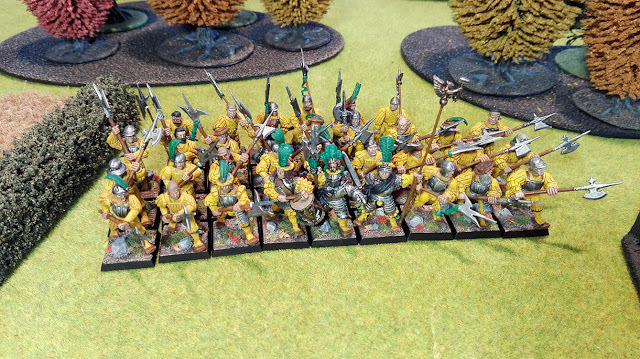 I'm really proud of them, because this is my first painted unit since I started collecting miniatures (1999... nothing! ), I guess this event has pushed us all to paint more! 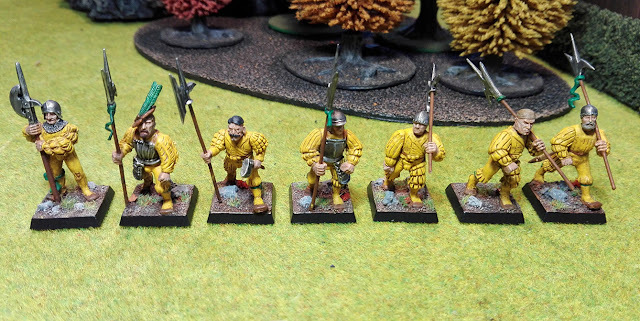 Models are Halberdiers from 5th and 6th edition, alongside a 4th ed. command group and also a rank & file model. I got these ones on ebay, while I bought the plastic models around 10 or 15 years ago, and I had to fix them because some parts were broken. 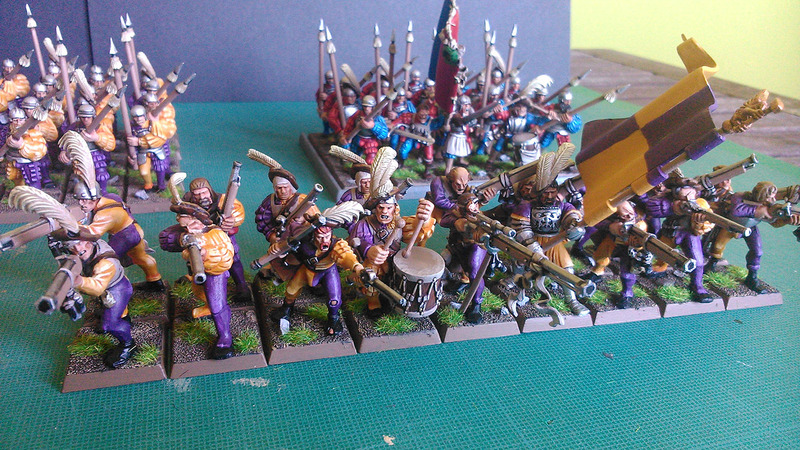 Also, I’ve done some conversions since I didn’t find enough arms with halberds to assemble all the models. Some halberd handles are made from paperclips, which I have embedded halberd poles from 7th ed. 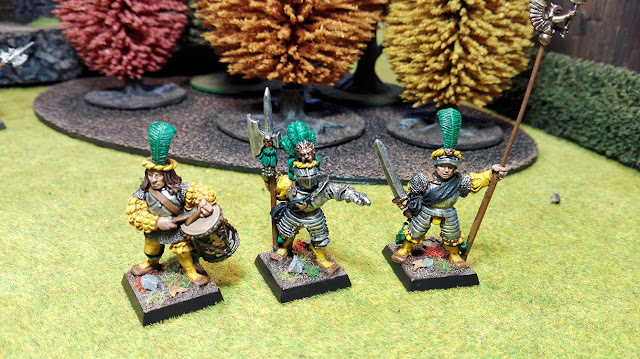 (current catalogue); these models are on the rear rank of the unit, simulating to be on march. In painting terms, I have dedicated more work to the command group, while some lights are not detailed with the same accuracy in the rest of minis; although, I am more than satisfied with the result of the unit, and I didn’t want to spend more time. 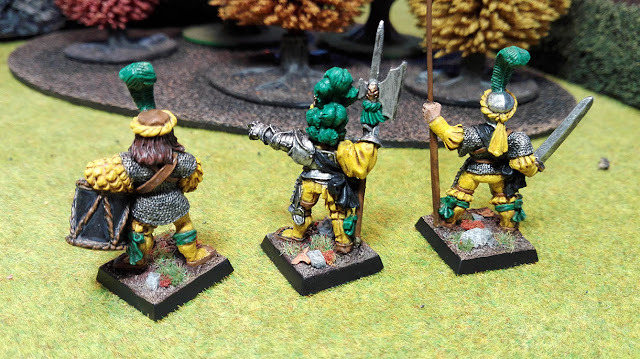 In contrast, the bases are accurately worked on all models. 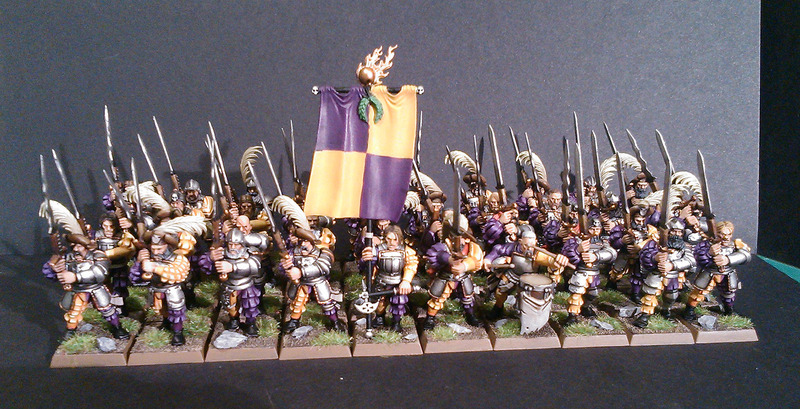 I will make the banner when the rest of infantry units have been painted. More pics on blog, hope you enjoy it! More heraldry too add... Carroburg! The renowned Greats Swords will appear. 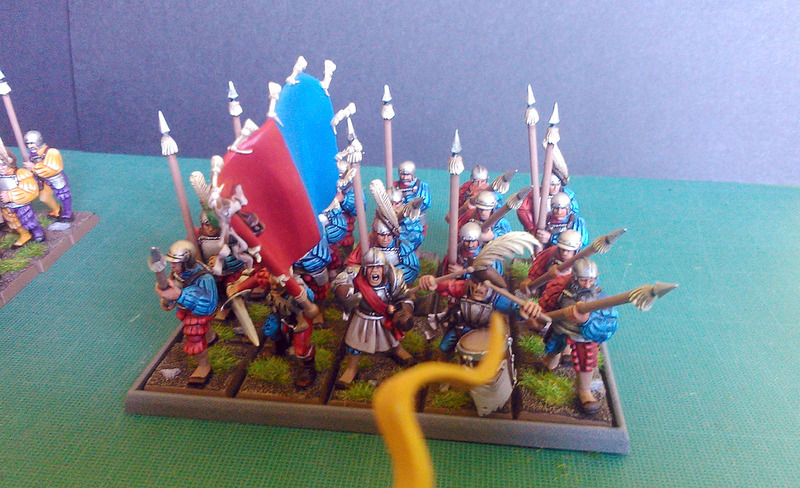 About my troops, they are mainly based in Stirland province, although it includes units with another heraldry. I think that usually Empire armies shall be "confederal" armies, not only raised from one place. Then, I've chose frontier provinces to help to explain the set up of my army. Always nice to see more Stirland. That classic command triplet is really nice. I've got those figures waiting for paint, but other things must be completed first. 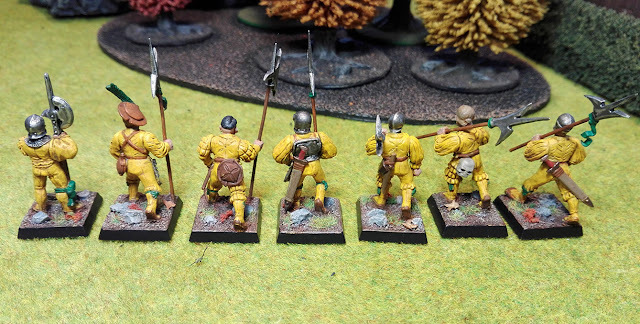 I see you've converted some of the halberdiers to carry the halberd on their shoulder. Could you gift me with a photo that shows the converted arm & hand? Please. Hi, sure Zygmund. The most of right arms come from the same sprue, just are the swordmen ones. There are also left arms that I made from the halberd ones, that come without a hand. I cut left hands of another arms (I don't remember exactly which ones now, but it might be the state troops or the militia sprue), I drilled them and I put it on the paperclip at the same time that right hand. You have pics with better resolution on the blog, I didn't get how to post them here. Thanks, Drakenhof. That clarifies it. I think I have a good number of those Empire Soldier arms. They seem to fit nicely, have to try it myself. I don't know why you haven't painted a complete unit before! They look great! I have long wanted to build a war altar just like that. Now I don't need to! Beautiful work. I agree, torches would look great on it, and polish it nicely. If you need any bits, I can see what I can rustle up. Thank you Warlord. Like you like it! The horde is bein' painted! That's a fair old amount to be getting on with! That represents about 2 years worth at my painting speed! Looking forward to seeing them finished, ranked up and ready for war! Hi, I'd just like to ask where this artwork is from? It's from 7th edition Warhammer Rulebook. What I don't know is its author. Could by art of Karl Kopinski or Paul Dainton, but nothing sure. 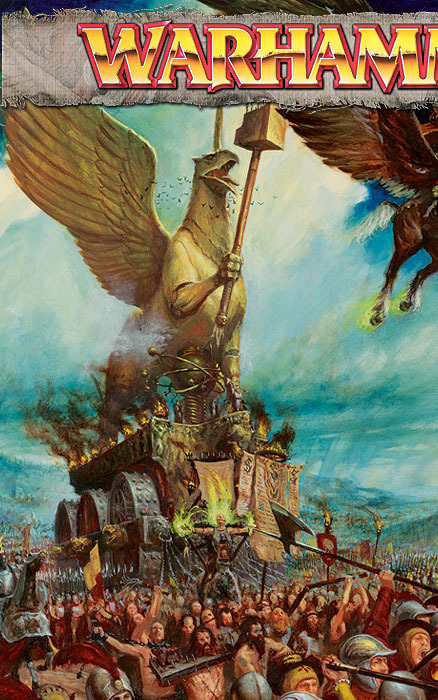 The War Alter is splendid, and all of the other miniatures are awesome. here we go with some more pics about the Battle at the Gates of Kislev. 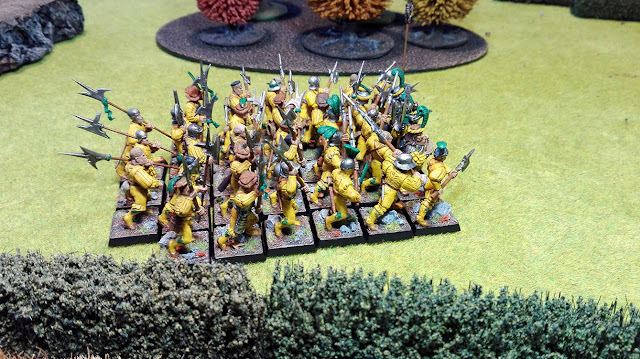 More Ostermark and Altdorf troops have joined the army. Are they actually highlighted to white or is that just the photo? No, none part of them are highlighted to white, except for the plume. It's a question of light and photo. But it's true that I use a bright yellow for last highlights on the clothes (Iced Yellow, from Vallejo), and also Runefang Steel (from Citadel) for the last ones on metal. And both are really bright. 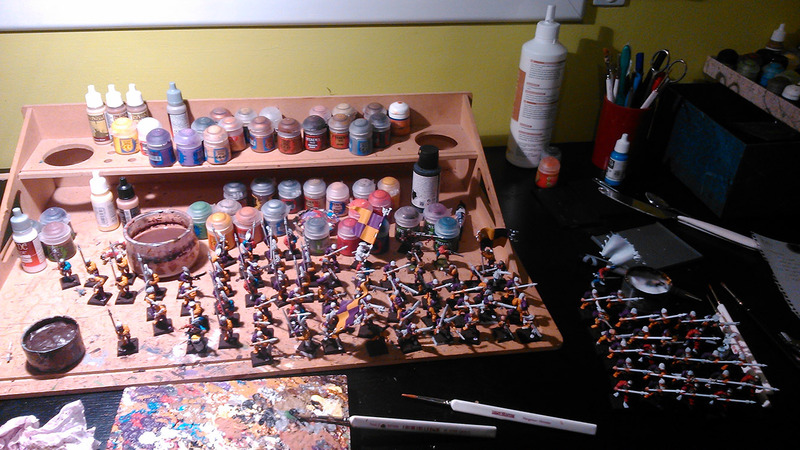 I am currently painting 17 chaos knights, 10 chaos warriors, 3 fillers for them and Engra Deathsword. Don't know what I will paint next but, sincerely, I prefer to get me off most of large infantry units and leave most of the characters at last, when I can paint them more relaxed.